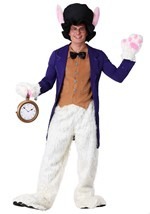 The dark green velvet mad hatter costume jacket has gold button accents; the collar and cuffs are trimmed with a black polyester material with gold thread woven in to give the costume some shimmer. The poly-foam top hat has a dark green velvet exterior to match the jacket. Elastic waist woven plaid pants. The vest is made of soft velour which has a orange, red and brown design on the front. The vest's lapel and interior are made of orange satin. The vest has velcro closure at the back of the neck and ties at the back of the waist. A cream colored shirt front as well as an ascot are included. The ascot is made of black polyester with gold thread woven in and has a gold button pin.